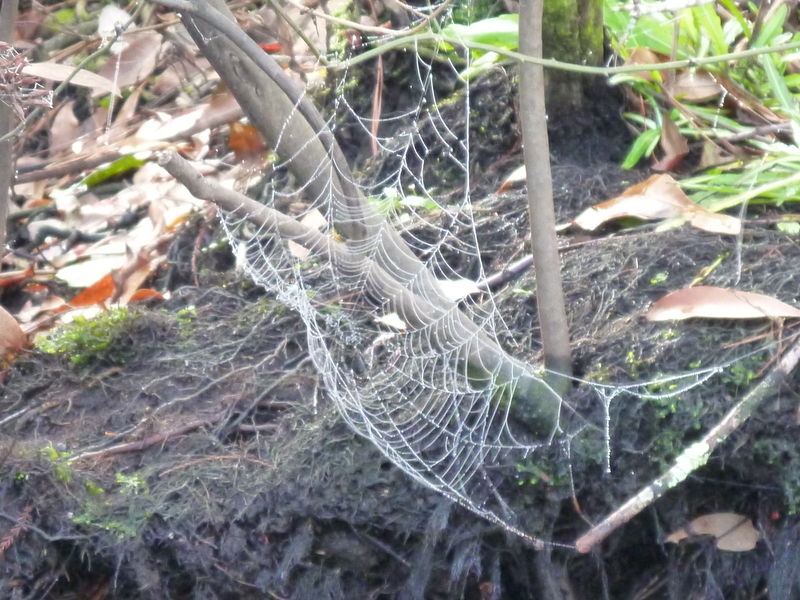 Early spring dew catchers, turning into jewels when brief sunbeams hits its beads. 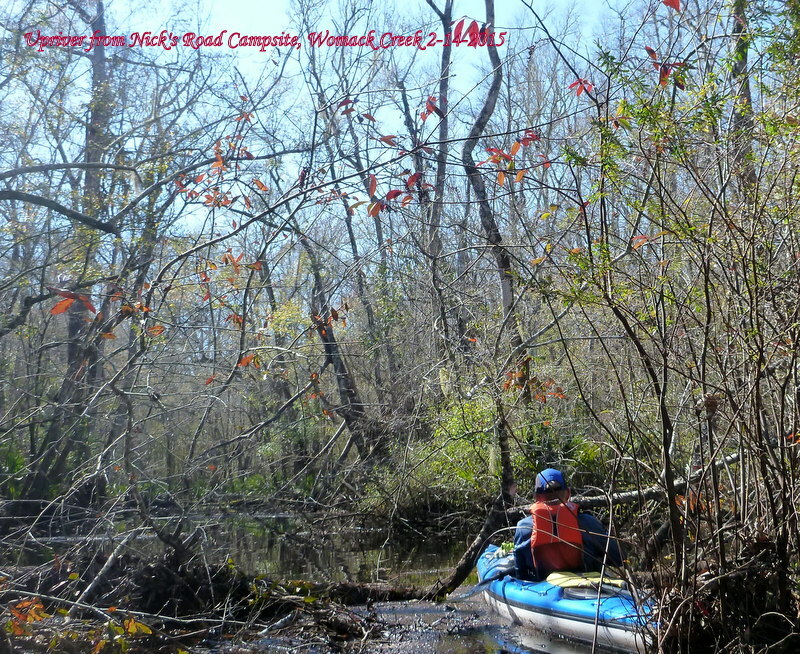 This entry was posted in Insects, Tate's Hell State Forest, Womack Creek and tagged Animals Tate's Hell, Paddling Tate's Hell State Forest, Tate's Hell State Forest, Womack Creek on February 15, 2015 by marylynanded. Ballot summary: Funds the Land Acquisition Trust Fund to acquire, restore, improve, and manage conservation lands including wetlands and forests; fish and wildlife habitat; lands protectiong water resources and drinking water sources, including the Everglads, and the water quality of rivers, lakes, and stream; beaches and shores; outdoor recreational lands; working farms and ranches; and historic or geologic sites, by dedicating 33 percent of net revenues from existing excise tax on documents for 20 years. 1) As provided by law, to finance or refinance: the acquisition and improvement of land, water areas, and related property interests, including conservation easements, and resources for conservation lands including wetlands, forests, and fish and wildlife habitat; wildlife managemetn areas; lands that protect water resources and drinking water sources, including lands protecting the water quality and quantity of rivers, lakes, streams, springsheds, and lands providing recharge for groundwater and aquifer systems; lands in the Everglades Agricultural Area and the Everglades Protection Area, as defined in Article II, Section 7(b); beaches and shores; outdoor recreation lands, including recreational trails, parks and urban open space; rural landscapes; working farms and ranches; historic or geologic sites; together with managment, restoration of natural systems, and the enhancement of public access or recreational enjoyment of conservation lands. 2) To pay the debt service on bonds issued pursuant to Article VII, Section 1(e). This entry was posted in Uncategorized and tagged Florida Land Acquisition Trust Fund on February 15, 2015 by marylynanded. 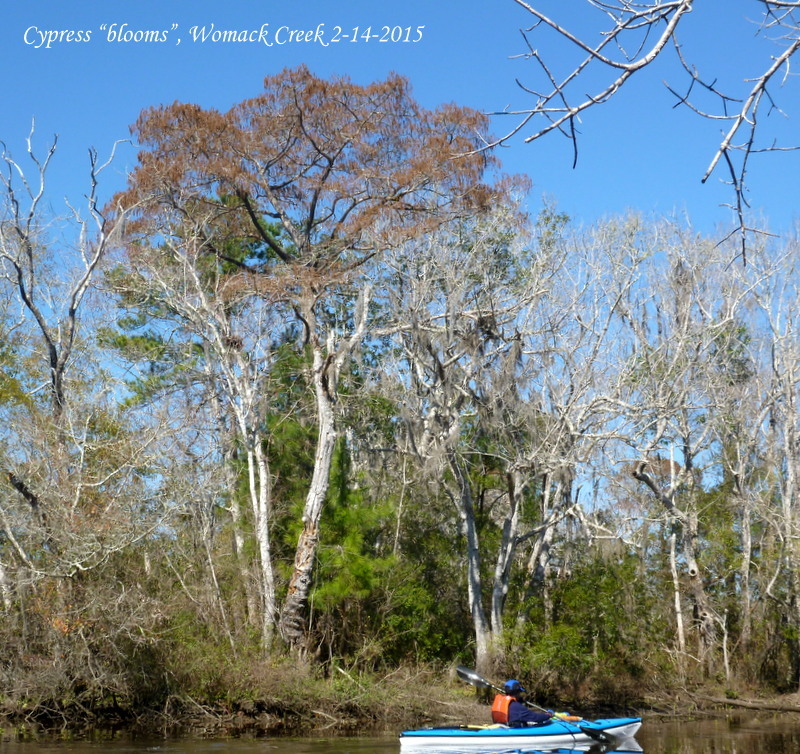 Valentine’s Day Paddle, Womack Creek and all its branches, blue sky, crisp day — what more could we ask for. The day was glorious, though cool, wind from the north with some chop on the Ocklockonee, but once within Womack Creek, the water calmed. 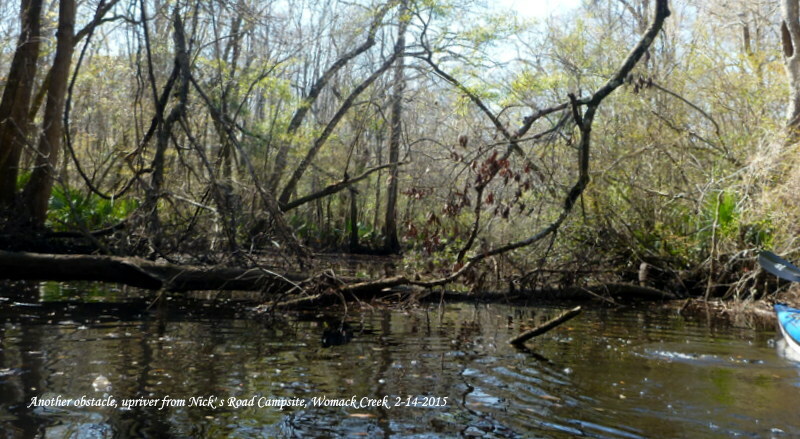 We were looking forward to seeing more buds on Womack Creek. But it is mid-February — it was a hope. 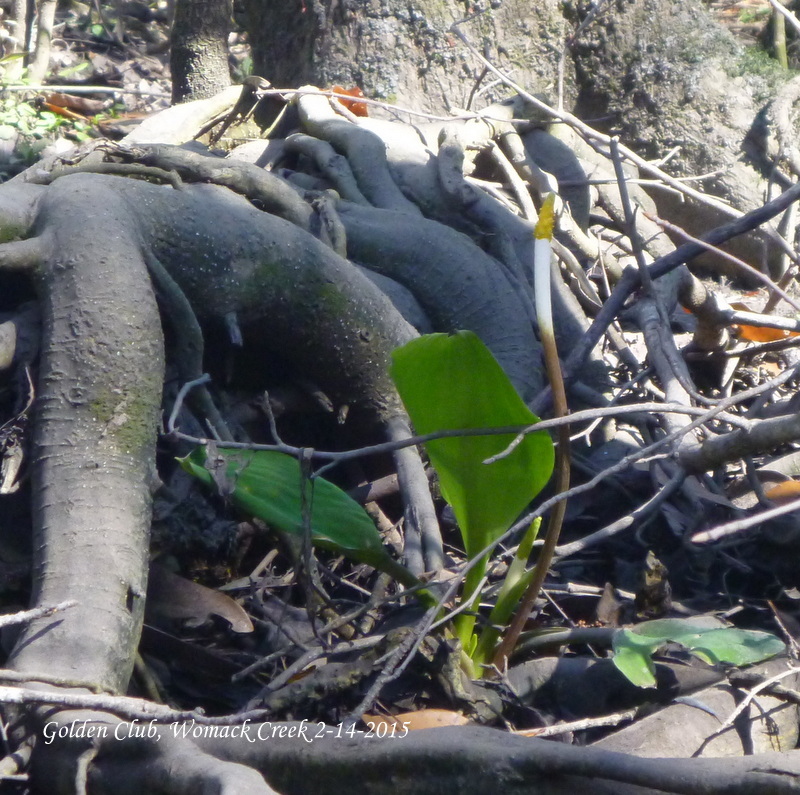 At the first cove on RR, a single golden club plant with one bloom stalk and two others still nestled in its leaves. 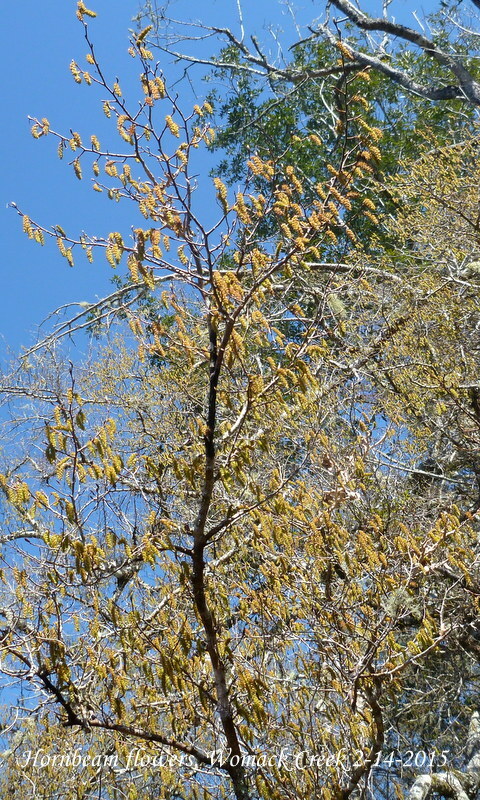 We didn’t expect the pumpkin ash buds, still tight, but promising blooms in two weeks. 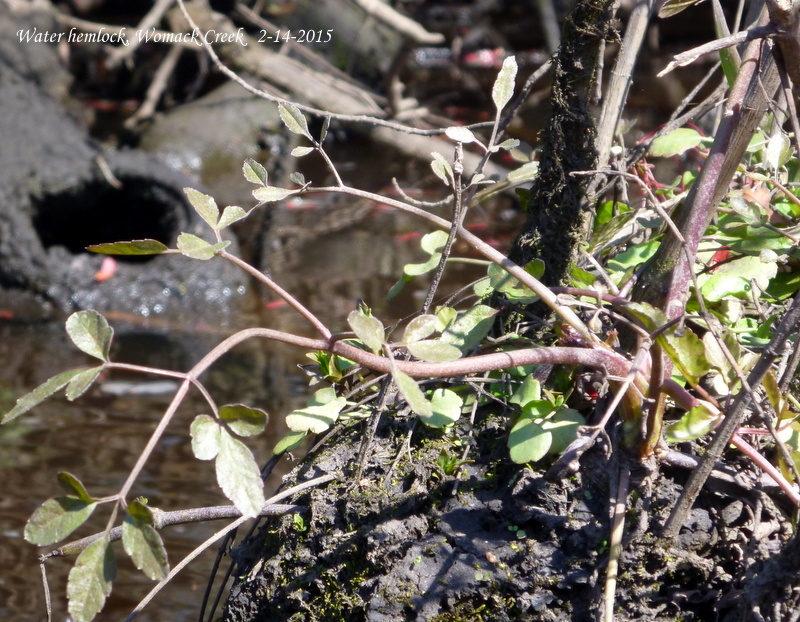 And in the first mile upstream, in a secluded, but sunny spot pinxter azaleas were blooming. The first of the season and an early bell weather. 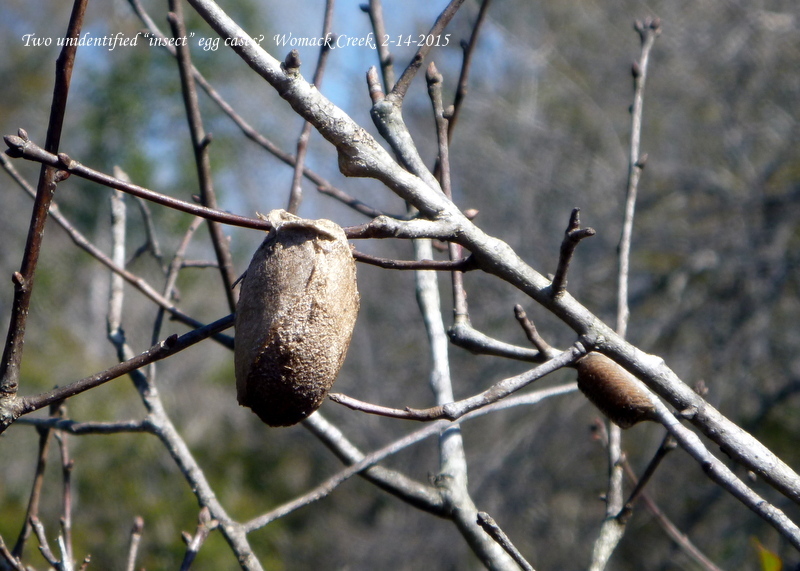 The other pinxster buds are still tightly closed, waiting for more consistent spring weather. This was a Valentine’s Day gift! 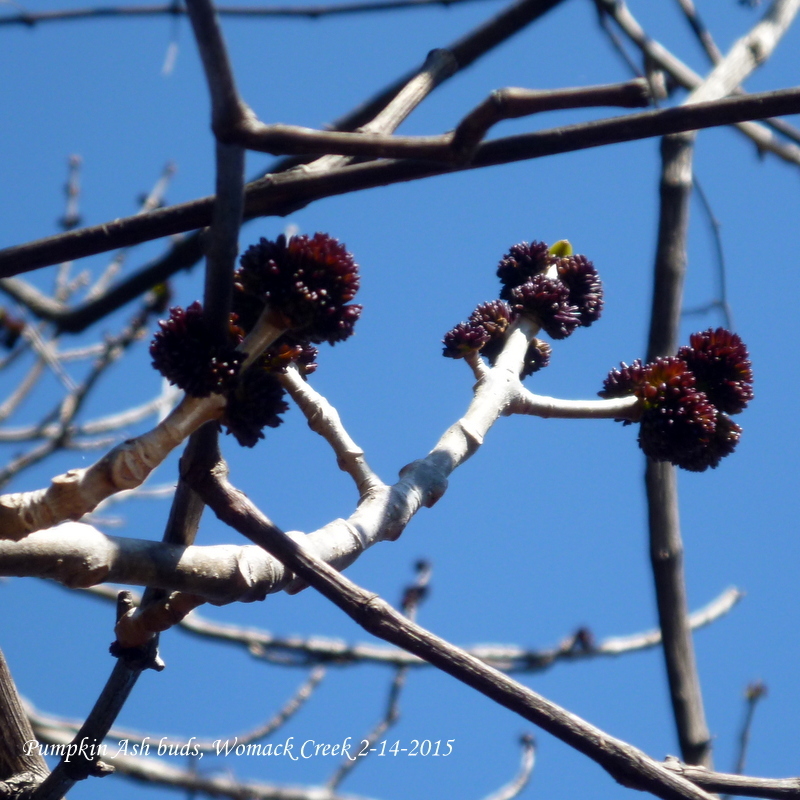 Not to take these little blossoms for granted, they were already in bud when we last paddled Womack Creek. 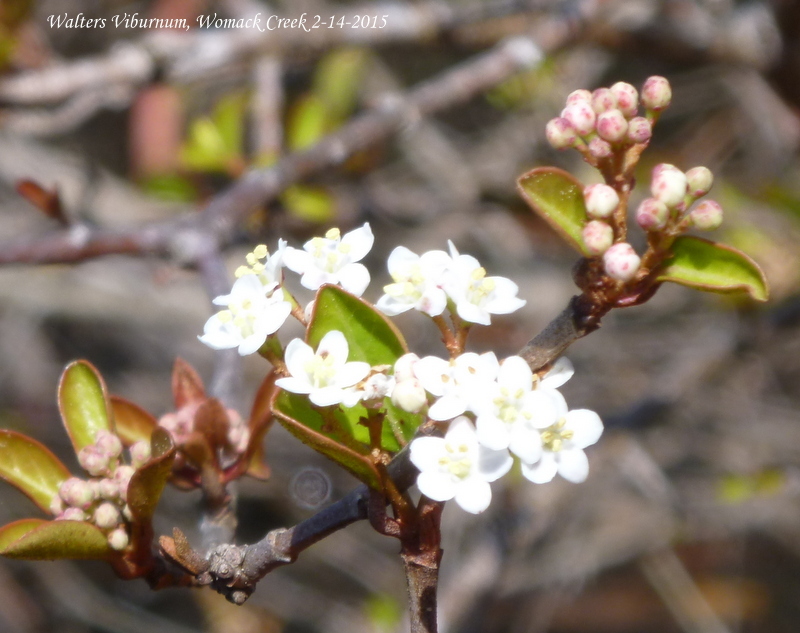 Now throughout the whole creek and all of its branches, the Walter’s Viburnum blooms are opening up. The earliest of spring flowers in the North Florida wetlands. 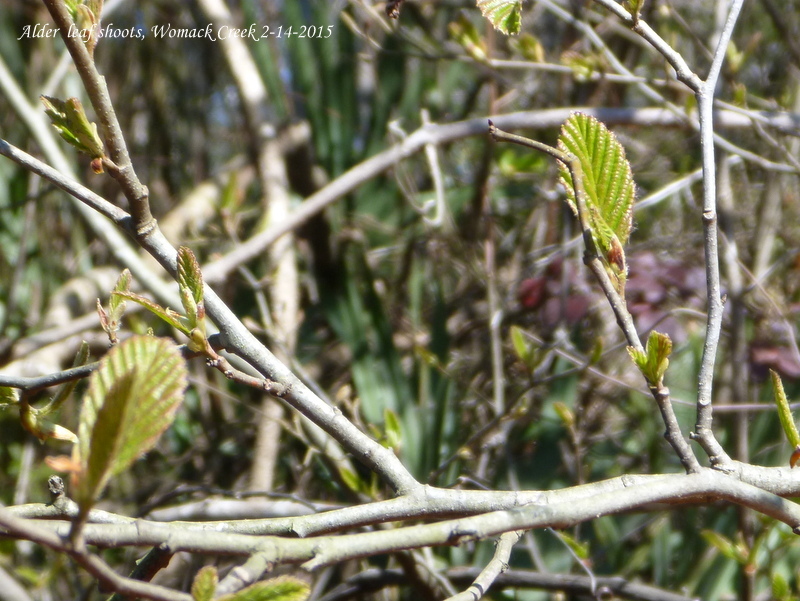 And the hornbeam trees were full of blossoms. Alders putting out their leaves. As the regular rain cycle has resumed, these alders have taken over many areas previously taken by False Indigo and Azaleas. And sweetgum leaves will be bursting out soon. And bald cypresses are now in flower. 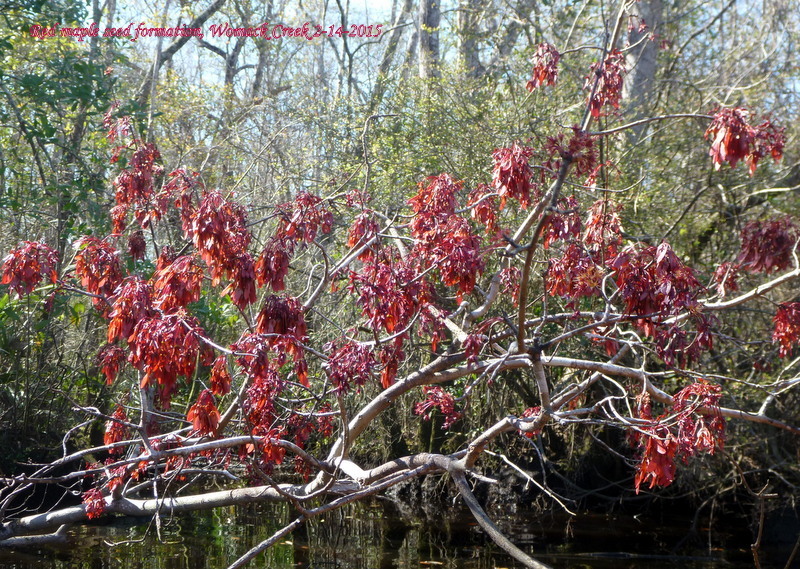 The Florida red maples are starting to develop seeds. On Womack creek it seems many of the maples are either male or female trees, although maple trees can have both male and female flowers on a single tree. And the deadly water hemlock starting with new growth. 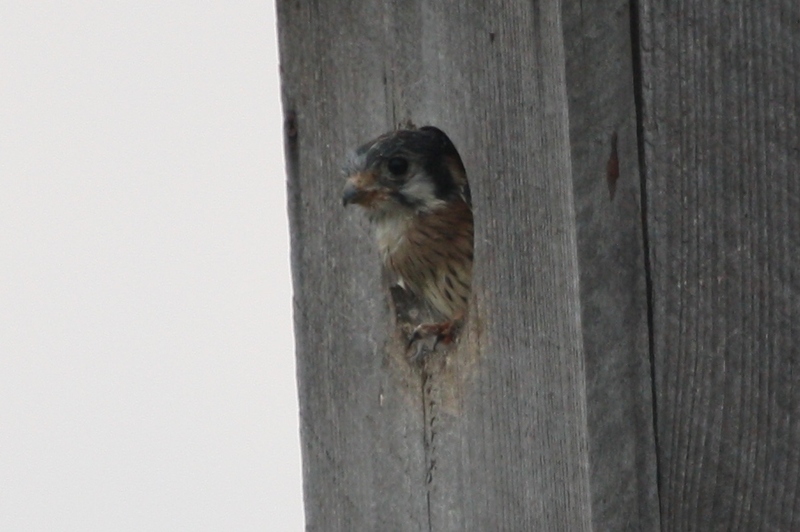 Insect cases, one case already emptied, the other still incubating. We decided to explore all the branches of Womack creek. About 2.5 miles from put-in on RL is a branch as wide as the main channel which flows past Nick’s Road Primitive Campsite. We took this branch first — we had not been on it for a year. It narrowed after about 1 mile and ended as do all these branches into a tangle of mud, branches, trunks — an impenetrable and not navigable dead end. 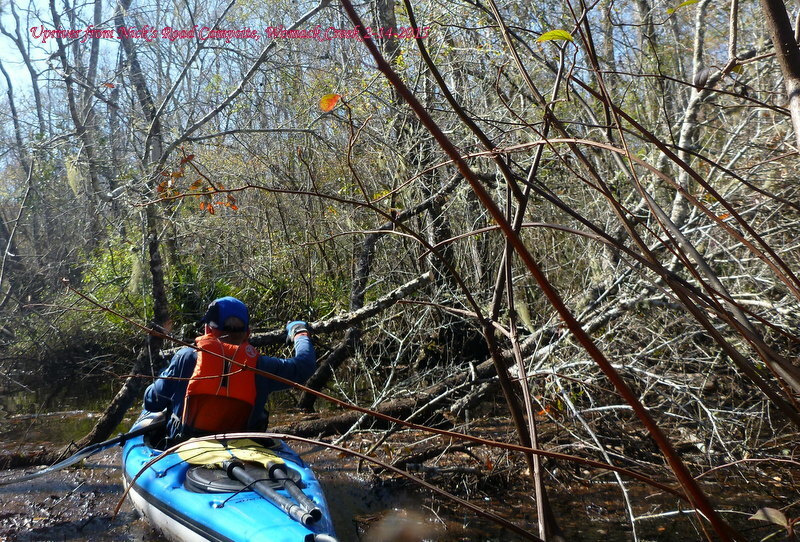 Exploration in the branches of rivers in north Florida requires saw and clipper. 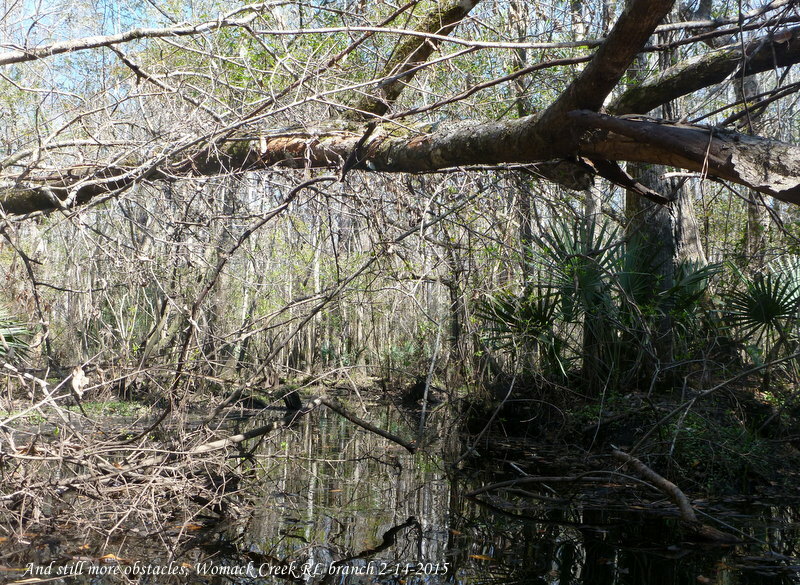 Downed trees block further clear navigation, forcing a portage in muck, branches either overhanging or dead can be cut through, strainers (collections of branches in the water like a dam) can be loosened and opened up. 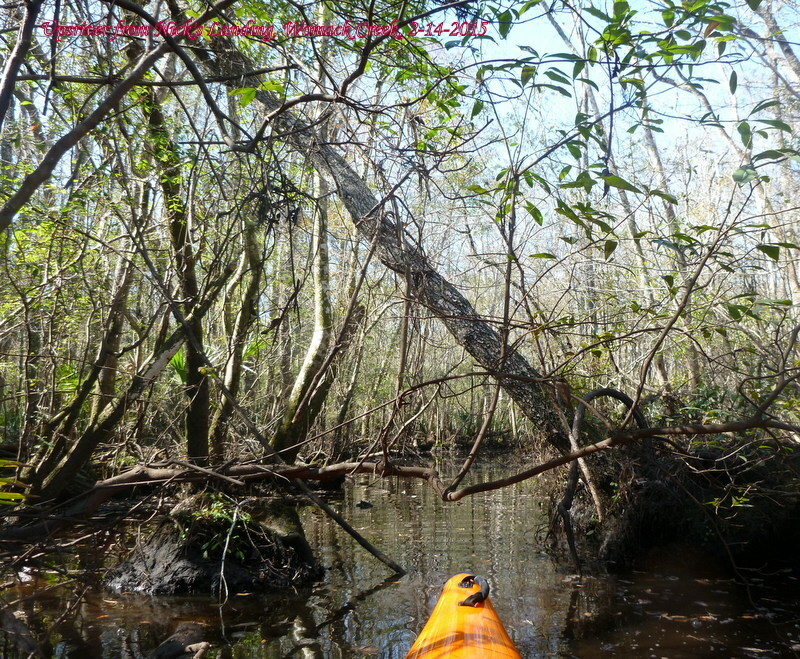 Some trees do not fall directly into the water and allow, depending on water level, for limbo paddling — one gets pretty good at what we call the “turtle scrunch” — receding into one’s cockpit with as much of one’s body and head close to the height of the deck to get under low trunks. In slow moving waters this is easy; in fast moving waters failure to coordinate and place one’s kayak properly can result in a capsize. With limbo logs, one has to note, where the creek or river is tidally influenced, whether one is going upstream in high or low tide. If one barely makes it under a log on an outgoing tide, on return in an incoming tide plan B will need to be pursued. 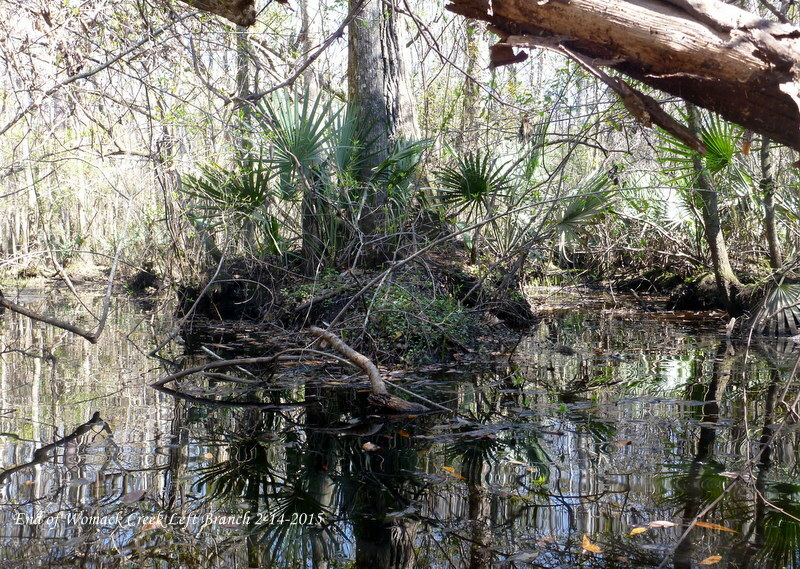 We learned this on Trout Creek, a small tributary of the New River, which drains from the Dwarf Cypress swamp. We were on one of our exploration trips which required, as usual, cutting through a path up river and found ourselves in an incoming tide on the way back. The space was barely enough for the kayaks, sans paddlers. And beyond that, more obstacles. A lot of situations like this. Often ending like this, slough 1 or slough 2. From put-in to Nick’s Road Primitive Camp Site which is a sunny spot with a picnic table, a fire ring and a grill, is 3.75 miles. This is a good place to have lunch. But upstream, there are two branches, each of which have increased in navigability in the last 3 years which were wetter than the previous 4-5 years. 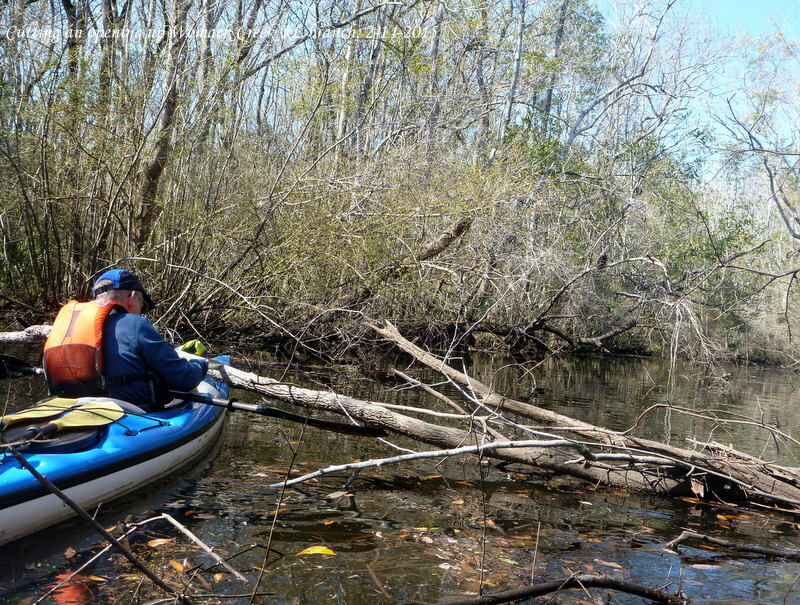 We were able to get up to the furtherest point we have ever paddle on the branch on RL (about 1.2 miles) and got much further up the second branch on RR than we have ever been before. These creek branches were equally as challenging as the first branch, but we were amply rewarded: an otter, a white tail deer, a pair of barred owls, a hawk in this section. And we were 1.2 miles from hway 67, where Womack Creek crosses to the northwest before we had to stop. This is the closest we have ever been to hway 67 on the creek. One has to be willing to hope for the best. But it wouldn’t hurt to test the depth of the water occasionally. A sharp saw a necessity when one decided to explore small branches. There’s always that last barrier one is willing to cross. Nothing convinces more than a series of obstacles in close proximity that its time to turn around and go downriver to take-out. Today’s paddle was 11 miles. 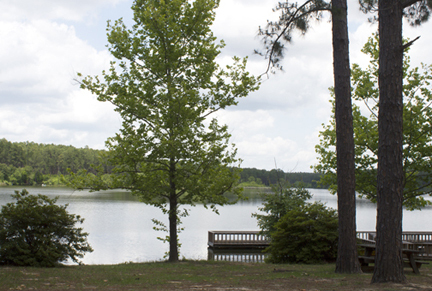 Our normal paddles on Womack Creek runs from 7.5-8.5 miles, upstream and downstream. We put in at a temperature of 56 F and took out at 60 F. The winds had picked up, the tide had turned, and we were ravenous. 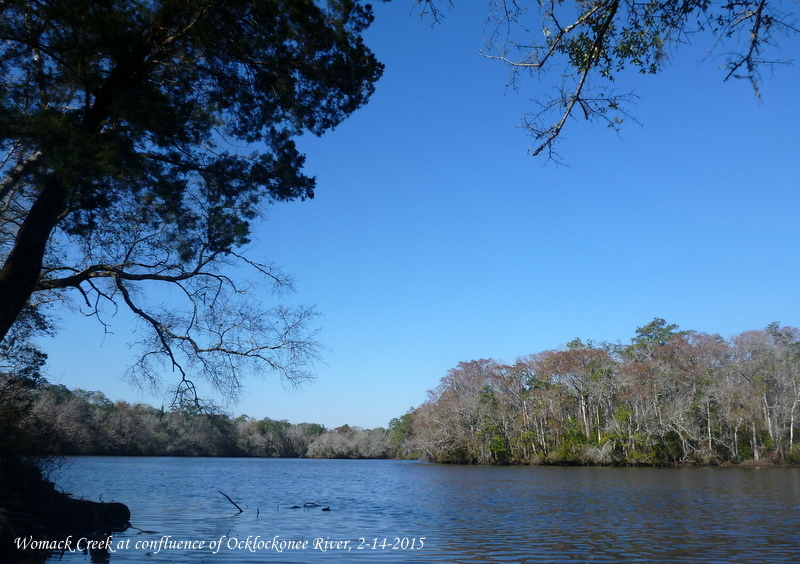 The sky remained cloudless, the air crisp — in the protected waters of Womack Creek the 10-12 mph winds were not felt. 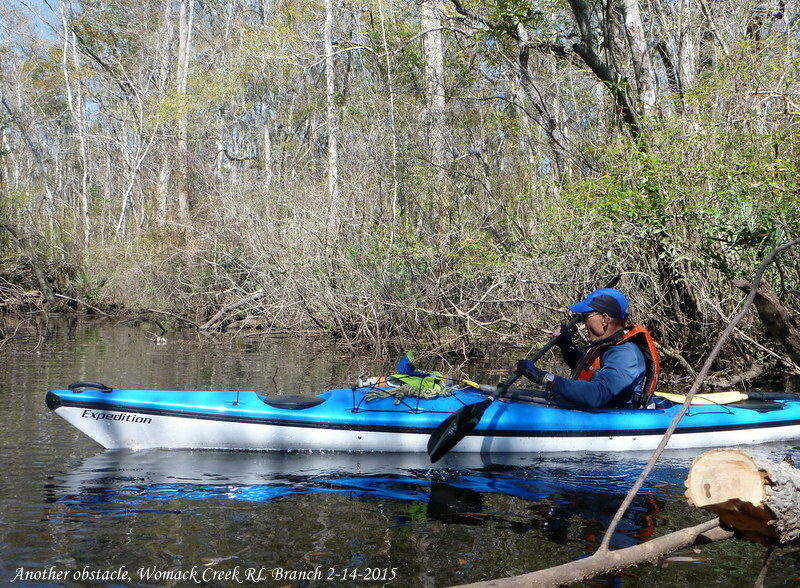 A bit of chop leaving Womack into the Ocklockonee, but it was a short paddle to the take-out. What did you do on St. Valentine’s Day? 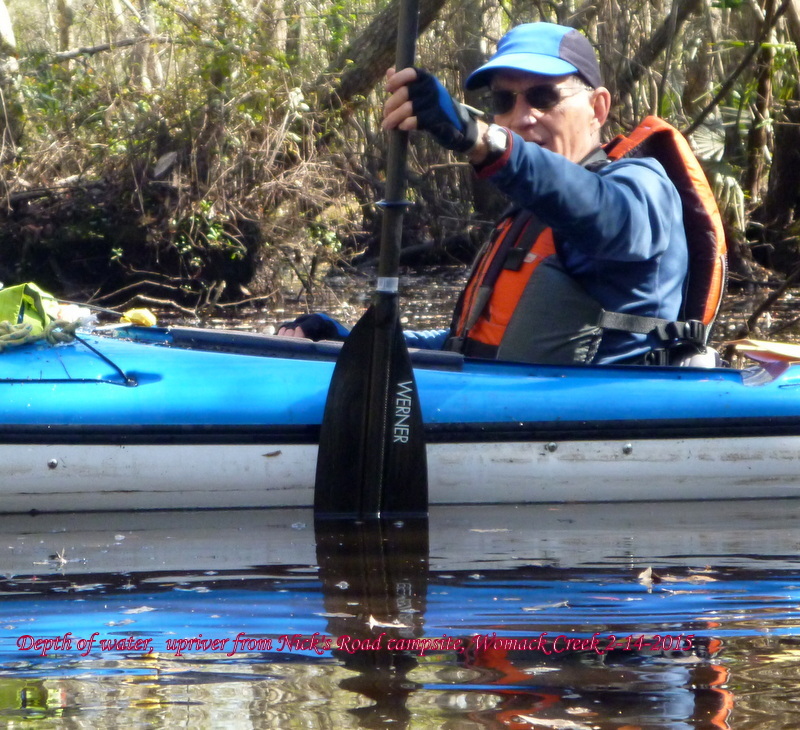 This entry was posted in Paddling, Tate's Hell State Forest, Womack Creek and tagged Paddling Tate's Hell State Forest, Womack Creek, Womack Creek paddling on February 14, 2015 by marylynanded. 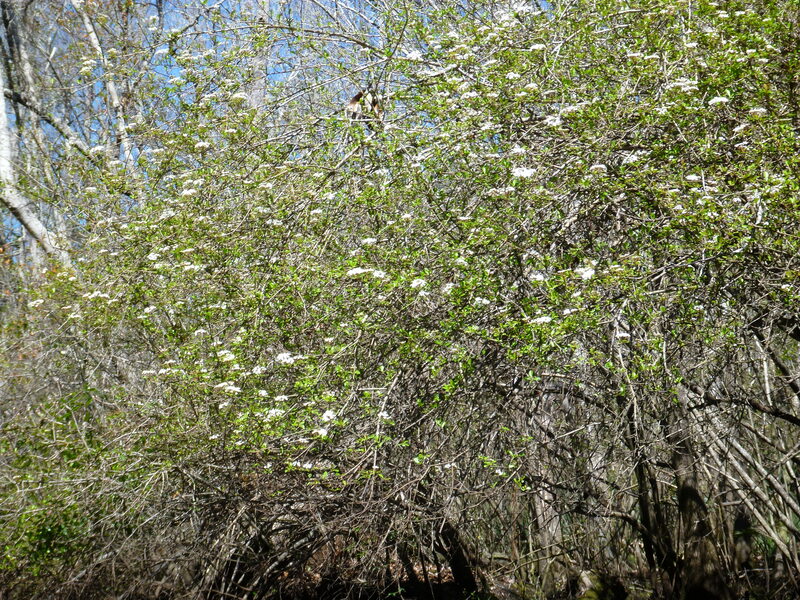 Blooming first in the upper 1/3 of the creek, then moving toward its confluence with the Ochlockonee, Walters viburnum forms clusters of tiny white blossoms. February 28, 2014. 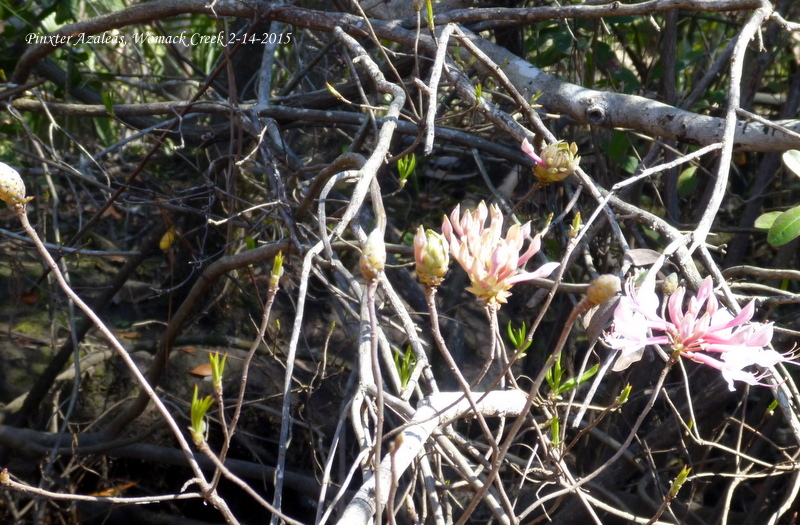 This entry was posted in Tate's Hell State Forest, Tate's Hell wildflowers, Womack Creek and tagged Tate's Hell State Forest, Womack Creek on February 11, 2015 by marylynanded. *Includes public and private lands. This entry was posted in Bears, Tate's Hell State Forest and tagged Bears, Tate's Hell State Forest, Wildlife conservation on February 11, 2015 by marylynanded. 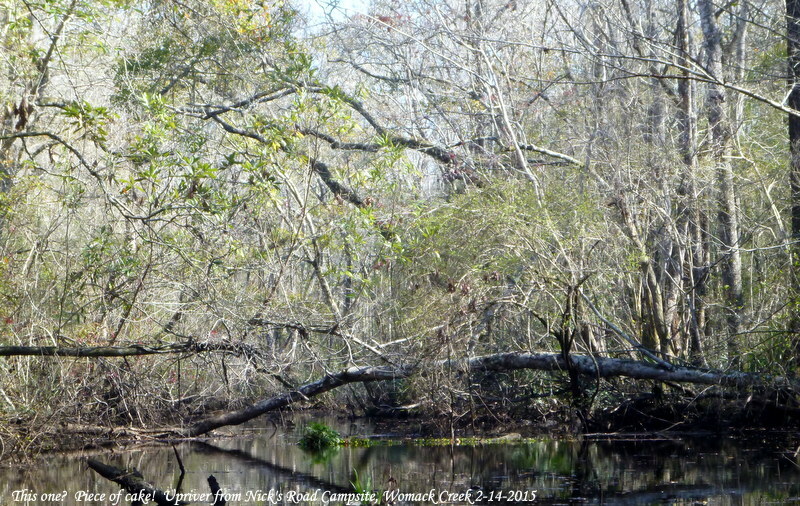 This entry was posted in Blackwater River State Forest and tagged Bear Lake, Blackwater River State Forest on February 11, 2015 by marylynanded.